Ready? Set to take off on a new writing adventure? Go! This is exciting! I’ve been asked if I would participate in an author blog hop. There are four questions I’m to answer and that wasn’t the first one. I received the invite from Megan LaFollet an editor (She edited my novel The Dry) and a writer. Click on her name to find out more. Her upcoming sci-fi/f novel sounds like something I’d love to read. Good question, wait…that’s the first one isn’t it? Okay, I’m so prepared. Let’s see, notes? No notes. To be totally honest I’ve just received my novel Deadly Thyme back from my copy editor, Rhonda Erb. Wow, I’ve got some small rewrites to finish up and then the new improved Deadly Thyme will be available on Amazon …perhaps within a month. Finally! Yes, I know. Here’s where it gets interesting. I do have a new novel I’m working on. It’s a historical YA. It takes place in Houston in 1970. In the story there are three major conflicts surrounding the main character, one involves a dangerous school environment, one involves abuse in her family, and one involves the Vietnam war because her brother comes home permanently disabled. I have read books about the Vietnam war, I’ve read YA books about family abuse, and I’ve read YA books about conflicts in school. But I haven’t read any historical YA books where the story takes place in 1970, much less in Houston. I think it might be a bit unique. The answer, my friend, is blowing in the wind. Oh wait, that’s from a song Bob Dylan sang in 1962. I’ve finished two novels, one is an adult psychological suspense, Deadly Thyme, set in Britain. I wrote it because I love page-turning suspense and mysteries set in Britain. The Dry is a children’s fantasy book and I wrote it because the story in my brain wouldn’t leave me alone. And I’m fascinated by insects. Thank the Lord they are small. The present YA I’m writing because this story has been part of my life for forty years. Yes, it is autobiographical, but I’ve created a character who is nothing like me – to make it more readable. You’re welcome. I clear my work space, and lay out paper and a good pen. To begin with I write scenes long hand. I love the feel of the pen and the quick scribbles and mark-outs. It feels like I’m doing something. When I go to type what I’ve written in Word I tend to add and embellish but the original pen to paper writing is where the real story gets created. If I get stuck in the story I go back to pen and paper and usually the pieces fall back into place there. I listen to music while I’m writing. At present, as you may have guessed, I’m listening to songs from the 60’s and 70’s. Good stuff. If that doesn’t make the story flow I listen to wordless music, usually Vivaldi. Classical guitar music makes my heart soar and ideas to pop into place. If you want music, it’s important to use music with the Adagio tempo, as the rhythm falls in with the human heartbeat. For my first two novels I did not use any sort of charts or outlines. Each first draft took about a year to write. I started rewrites. Yes, I worked on both at the same time. Ten years later and I was still thrashing about with the muddle at the middle of each. I had written out the original story on a few pages and that became my fall-back outline. Otherwise, I’d still be working on them. My first drafts tend to be too visual, so I have to wedge in the taste, touch, feel, and the smelly bits into later drafts. With each of these novels I sought out advice and help from my writing instructor Chris Rogers, and from my good friend Kimberly Morris who has over sixty-five published books. 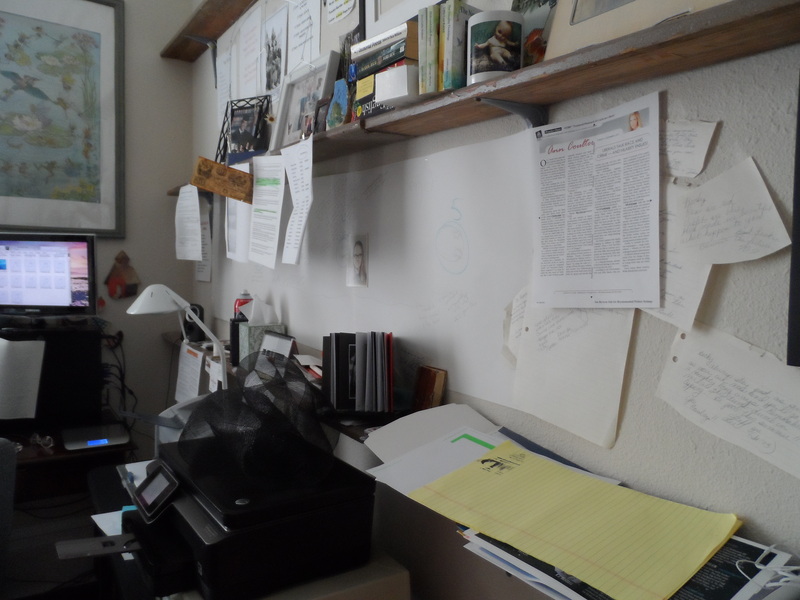 So, for my new YA I have an outline, and a timeline stretched across the wall of my studio. It has already helped. I’ve been interrupted more times than I can count, and I don’t mean just because the dog wants to go out and bark at the garbage truck again, or because dinner needs cooking. Life interruptions can last days, or weeks, or months. Fortunately, because I’m more organized, when I come back I know where I was and can start again. Now I’m going to recommend that you check out what these authors are up to and how their writing process works.